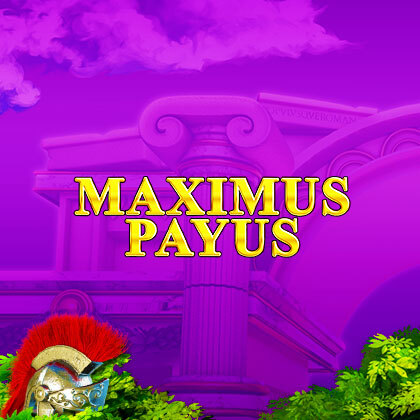 Become a top Centurion in Maximus Payus, a 5 reel, 1024 ways to win slot by Inspired Gaming. Your quest is to conquer the game and take home the ultimate prize, the £500 jackpot! Maximus Payus is an exciting slot game with an Ancient Rome theme. Put on your armor and grab your sword as you're about to battle to win a huge pot of gold. Only the brave can conquer the jackpot! There are plenty of great features in this slot including a free spins bonus feature and a reel bonus feature. Join today to play. Maximus Payus is a 5 reel, 1024 ways to win slot by Inspired Gaming with an Ancient Rome theme. Your job is to conquer a very important quest which will help you win the jackpot and be crowned the ultimate Centurion. The design is greatly done and the 3D animations are very bold and bright. All of the symbols fit the Ancient Rome theme and include Maximus, a helmet, a shield, a charioteer, and playing card symbols 9, 10, J, Q, K, and A. The Wild Symbol - The wild symbol in Maximus Payus is the golden laurel. The wild replaces all other symbols apart from the bonus symbol to create winning combinations. Free Spins Feature - Landing 3, 4 or 5 bonus symbols will award 8, 15 or 20 free spins. All wild symbols will become 2x multipliers during the free spins feature to help you form even better wins. This feature can be retriggered to win even more free spins and cash prizes. Big Win - Unlocking the big win feature will award you an instant win of 20x your stake or more. Five Of a Kind - This feature award one or more five of a kind wins. Fortune Bet - If you want the chance to double your payout then click onto the fortune bet button. Here the bonus symbol will double in hight which will give you a greater opportunity to activate the free spins. Inspired Gaming is one of the largest online casino operators in the iGaming industry with many of their titles being available on Easy Slots. They have been developing original and innovative casino games and slots for over 10 years. Their games are enjoyed by players across more than 30 countries, with the majority of their fans being in the UK and Europe. Maximus Payus is a fun and straightforward slot. The theme is great and consistent throughout. There are quite a few features in this slot which makes the game very entertaining. Perhaps the best thing about Maximus Payus is the fortune bet option as you can double your wins here. Click now for similar.